The 4th of July is almost here! It’s one of my favorite holidays because it involves summertime, explosives, patriotism, and a whole lot of a good food. These cupcakes were inspired by a Betty Crocker magazine that I picked up at the grocery store. You can make them homemade or go super-simple (as I did) and use a box mix. 1. Bake the cupcakes according to box directions. Allow the cupcakes to cool entirely. While the cupcakes are cooling, make the candy melt squiggles. 2. Melt the candy melts in the microwave (or you can use a double-boiler). Be careful with this step otherwise they will burn. I microwaved my bowl of candy melts in 10-second increments and stirred after each increment. They will eventually melt and stir into a smooth mixture. Be patient with the microwaving and go slow. 3. Lay out a sheet of waxed paper. Fill a piping bag with the melted candy melts. Snip off a small corner of the piping bag & pipe out little squiggles of candy melts onto the waxed paper. Allow the squiggles to sit for at least an hour, preferably in a cool location. 4. Once your cupcakes have cooled, frost them with icing. 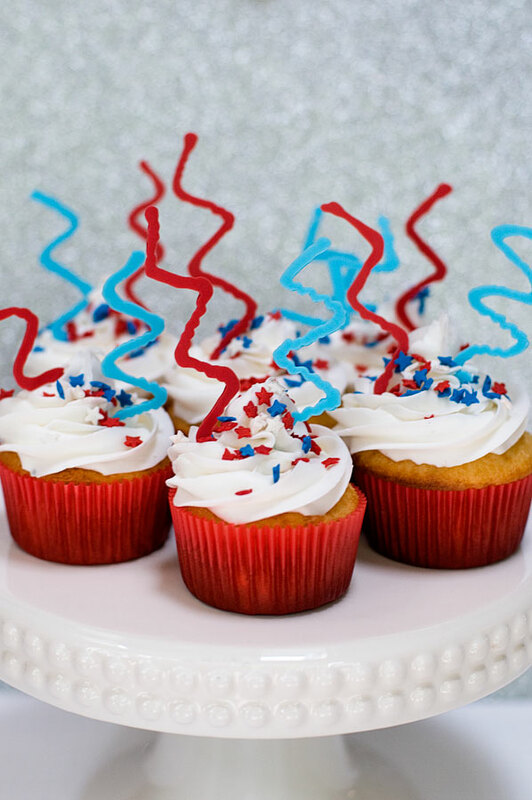 Decorate the cupcakes with red, white, and blue sprinkles if you’d like. Carefully peel the squiggles off of the waxed paper and stick them into the cupcakes for decoration.